This week, Your News to Know rounds up the latest stories involving gold and the overall economy. Stories include: Three reasons why gold will reach $1,500 this year, gold forges its best run since 2011, and Goldman Sachs expects gold to outperform amid fears of stock correction. According to Frank Holmes, chief executive officer of U.S. Global Investors, gold is set to hit $1,500 an ounce in 2018 with several potential flare-ups that could send prices flying. Talking to MarketWatch, Holmes gave three reasons why he thinks gold could gain up to 11% this year and reach levels last seen in 2013. The first of these is a surge in inflation past the Fed’s targeted rate of 2%. Multiple indexes show a sharp rise in inflation year-on-year, and the alternate CPI estimate places it closer to 10%. A sudden realization that inflation has gone up faster than expected could send the markets into a panic, boosting gold’s appeal as a result. The metal has already benefited from the recent weakening of the dollar, and a continuation of this trend would act as a major driver of gold prices, said Holmes. The outlook for the dollar seems clear as several prominent government figures, including President Donald Trump and Treasury Secretary Steven Mnuchin, have supported the greenback’s downtrend. 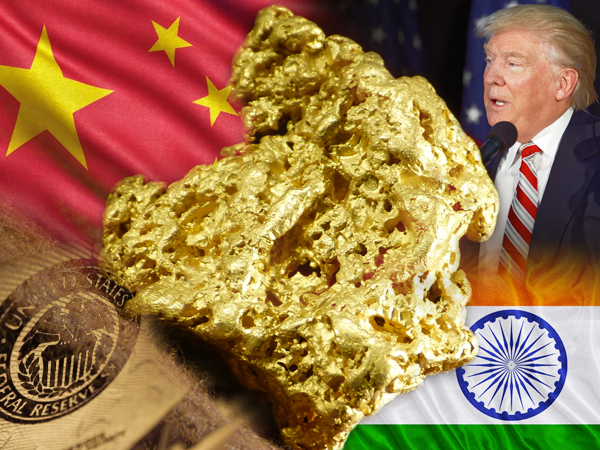 Holmes pointed to an improvement in China and India’s GDP figures as likewise bullish for the metal, and an increase in purchasing power from two of the world’s top gold consumers is bound to positively reflect on gold demand. As both nations expand their middle class, the annual spike in gold price during the September-February festival season could become much more pronounced. The executive also sees promise in the ongoing lawsuits against big banks over their role in gold price manipulation. Should market rigging be outlawed, Holmes believes that gold would finally be free to inch towards $1,900 an ounce. Rounding up his list of bullish factors, he notes that a potential upset to the jewelry industry could reignite North American demand for physical gold. With efforts by Pablo Picasso’s granddaughter Diana Widmaier Picasso to introduce ornaments with smaller designer fees, jewelry could finally be seen as an investment in the West, letting gold prices reach new heights. As bullion posts its third quarterly gain for the first time since 2011, gold investors could be looking at a repeat of the run that saw prices reach a record $1,891 an ounce. Bloomberg notes that gold’s rise is all the more notable given the Fed’s hawkish policy so far, with the metal quickly recovering from each of the hikes. A large portion of the renewed interest in bullion has come from heightened tensions, including the possibility of trade wars between the U.S. and several other countries. In particular, some have expressed concerns that the back-and-forth between U.S. and Chinese customs is a precursor to more stringent import restrictions. Some of President Trump’s appointees, such as John Bolton as the new national security adviser, also brought concerns that the White House will assume a more hawkish stance towards some Middle Eastern nations. Rounding up gold’s tailwinds, the recent string of stock market plunges has reintroduced fear to the once-idyllic market, and a growing number of investors now look to hedge their bets with bullion in case of a prolonged downturn in equities. According to CNBC, the latest research note by Goldman Sachs shows that the bank’s analysts have assumed a bullish stance amid a slew of favorable factors. Although some, including the bank, forecast up to four interest rate hikes this year, the team says that gold will continue to thrive in an environment of higher rates. The team also said that the stock market is seeing an increase in risk after a lengthy period of calmness. Coupled with a possible spike in inflation, concerns that equities might be nearing a correction should give way to higher gold prices over the coming months regardless of the Fed’s policy.